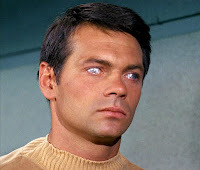 The name of the new Star Trek movie villain has not been released, but a slip from actor Karl Urban gave the name "Gary Mitchell." Who is he? Benedict Cumberbatch has been confirmed as the unnamed villain in the next Star Trek film. Producer Damon Lindeoff has only said that the character will be "an iconic film performance." While promoting his new film Dredd lead actor Karl Urban, who plays Dr. "Bones" McCoy, talked to SFX about working with Cumberbatch. "He’s awesome, he’s a great addition, and I think his Gary Mitchell is going to be exemplary." 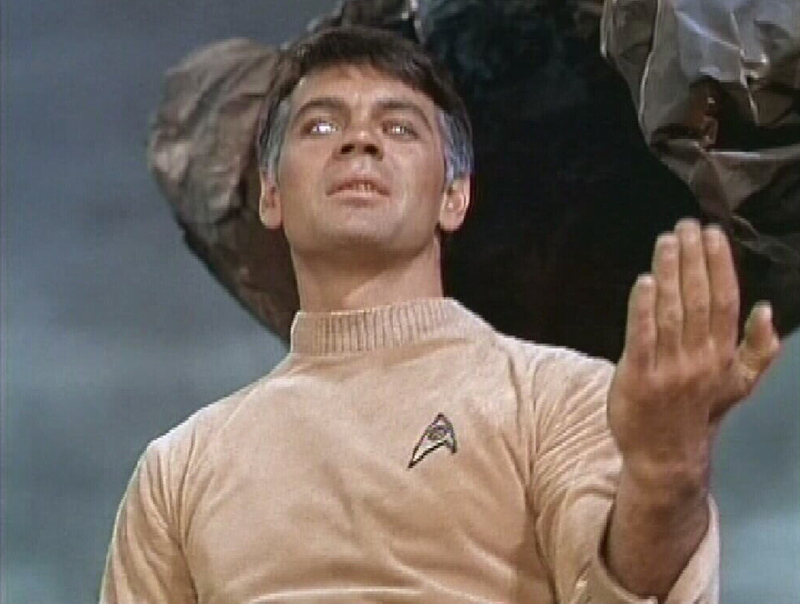 Gary Mitchell, played by Gary Lockwood, was in the 1966 Star Trek The Original Series episode "Where No Man Has Gone Before." He's a helmsman on the U.S.S. Enterprise. After the ship comes in contact with an energy field called "The Galactic Barrier" he gets powerful psionic abilities.Oh, those wacky Galactic Barriers. He starts off with minor powers like telepathy, extrasensory perception and telekinesis. As Mitchell becomes more powerful he becomes haughty, distant and cruel. Kind of like Donald Trump. Eventually Kirk tries to maroon him on the planet Delta Vega. But Mitchell has become so strong that he kills a crew member, stuns Kirk and Spock and escapes with his love Dr. Elizabeth Dehner. At this point his power convinces him that he is a god. Mitchell has the ability to control energy and materialize trees and other objects. 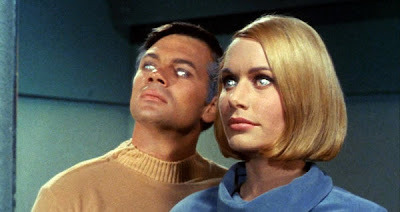 Gary Mitchell uses it to create a paradise and gives some of his power to Dr. Dehner. Eventually Kirk and Mitchell fight and he is killed. How Could Gary Mitchell Fit Into the New Timeline? In the original timeline Gary Mitchell is a student of Captain Kirk while he was at the Academy. Kirk is a Lieutenant and Mitchell is first-year cadet. When they meet again Kirk is a Captain and Gary Mitchell is a Lieutenant Commander. The relationship is ironic since Mitchell goes from a student to the master. Think Obi-Wan and Darth Vader. Only the master of evil Mitchell! But, that was the old timeline. There's a new one now. Considering Kirk left Starfleet Academy and immediately took command of the Enterprise that back story doesn't make sense. Also, since Mitchell must be much younger than Kirk, the new timeline would also have to ignore the ages of the characters. Here's a clip of Gary Mitchell fighting with Captain Kirk from the episode. 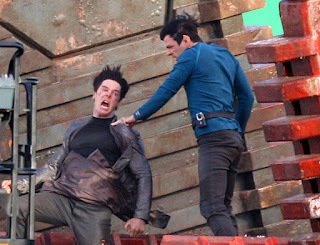 Here's a behind-the-scenes image of Spock (Zachary Quinto) fighting Benedict Cumberbatch. If they can make it work, it's a brilliant choice since the character is less well known than Khan. There would be fewer comparisons. Star Trek 2 stars Chris Pine, Zachary Quinto, Karl Urban, Simon Pegg, Zoe Saldana, Anton Yelchin, John Cho and Bruce Greenwood as the crew of the U.S.S. Enterprise. Peter Weller, Eve and Benedict Cumberbatch join the cast for the second film. Star Trek 2 is scheduled to open on May 17, 2013. What do you think? 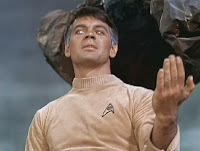 Would Gary Mitchell make a good villain for the new Star Trek movie? Click on the buttons below to tell your friends about this post. I think this is definately the way to go. Using lesser known villians from the original TV series means avoiding the usual fanboy cries of distain. I myself was ready to jump into a rant about the dillusional beilief that Ricardo Montalban could be replaced by Benedict Cumberbatch - JJ Abrams from hell's heart i stab at thee. For now it appear that my wrath shall have to wait. As regards the timeline situation (ah JJ you do like to reboot your universes don't you?) I don't see it as a problem. I think the new timeline has pretty much realigned to where it should be (Einstein would be so proud), given that Kirk missed the years of working through the ranks and become captain pretty much in his first week proper. This should more than account for his delay in entering the academy. Puts me more in mind with the last Star Trek Generations movie, Nemesis. I think they could make it work. Gary Mitchell doesn't really sound like a very scary villain. It sounds like someone who should be working in the Enterprise's accounting department. I think he could be a really good villain. Just depends on how they do it--of course. I think this could be really interesting. I love it when the enemy is close to home. It'll be interesting to know if this is yet another of those it's-him-no-wait-it's-not-turns-out-it-is deals. You'd think if the truth slips, the studio would just embrace it. It could be another red herring Tony. It may turn out he's actually the "Salt Monster." Melissa, his connections to Kirk would make him a great villain. Very close to home. Alex, that's interesting. I don't see the connection, but am open to suggestions. Montalbahn's performance is so iconic ReulctantGeek that it would be really hard to top. If he didn't have a Hispanic accent people would go nuts. The new timeline does work well for most things, but when it comes to character ages it may get dicey. Timelines are definitely Abram's thing. Mitchell would have made for a much better movie. I just watched the pilot, and Mitchell reminded me so much of Quito's Sylar, they should have just cast him as Mitchell and Pine's academy buddy from the beginning. Kirk would have had a different group of friends in those early days; Mitchell was even the one that sent Carol his way (blond lab technician) so they still could have had that subplot worked in. Khan was an utter dissapointment.